A new study published on Monday has revealed that businesses and families in London and Scotland are better placed to take advantage of the so-called “energy revolution” underway in the United Kingdom — benefiting from cheaper energy bills, electric vehicles, and smart appliances — but residents of the North of England and the East Midlands lag further behind, creating the risk of a two-tier economy. 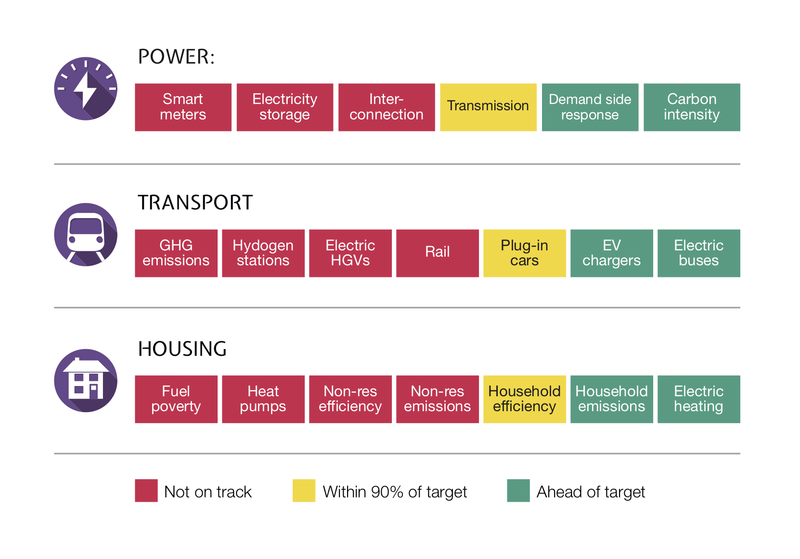 The study, conducted by researchers from Imperial College London and E4Tech and commissioned by British power generation company Drax Group, is the first such study to examine the country’s energy transition at the regional level and breaks down the transition into 20 separate metrics for the power, transport, and buildings sector, providing a barometer of national and regional progress. As the authors of the report point out, the “UK’s energy transition is well described by national and international expert bodies,” but this often fails to look at the situation beyond a macro-scale, subsequently missing the micro-scale impacts of the transition, i.e., how it is being played out regionally. The study, therefore, seeks to dig down into the specifics of the energy transition and investigate what it will mean for individual households, businesses, and society as a whole, and reveal the regional differences that are developing under current policies. “The country is going through an energy revolution,” said Dr Iain Staffell, from Imperial College London. “We are creating an energy system which will power our future economy and help tackle climate change. As can be seen below, London and Scotland are coming close to being on track to meet their overall targets. But, even that fails to understand the wildly varying realities. Renewable power is reliant upon natural resources, so Scotland and Wales have better access to low-carbon power per-person than does England, but Scotland and Wales have some of the lowest transmission capacities. Smart meters have the highest penetration in Wales and the North East, while London has the lowest, and the West Midlands and the East currently have the highest uptake of passenger electric vehicles, London the most electric buses, and South East, northern regions of England, and Scotland have the highest share of ultra-low emission HGVs. “Great Britain needs more secure, clean energy to compete in the future economy,” added Will Gardiner, Drax Group CEO. “There is an energy revolution underway which will deliver it – but this report uncovers worrying regional divides as we go through that transition. The underlying problem, as could be fairly well expected, is the different priorities placed on the energy transition by local governments through their investment and policies, as well as the simple fact that more affluent regions have the resources to involve themselves more in the transition than do poorer regions. London and Scotland jointly lead overall progress in the country, thanks in part to London’s green transport system and Scotland’s increasing levels of renewable energy. Both regions also boast relatively energy efficient residential homes, which are more likely to score high A-C Energy Performance Certificate (EPC) ratings, and have fewer buildings rated F and G. Conversely, the remaining regions are more likely to score low EPC ratings. Specifically, the combination of the cost of heating combined with lower average incomes results in higher fuel poverty rates. The research also shows that there is different progress being made within various sectors, as can be seen below. Specifically, the study found that work to reduce the carbon impact of the power sector is on track thanks to the large-scale closure of coal stations and the explosive growth in renewables. However, work to electrify heating, improve the energy efficiency of residential homes, and the electrification of the country’s railway system is falling behind. I also asked Dr Staffell how the UK’s energy revolution leaders — London and Scotland — can use their position to support the rest of the country.